Megalodon Shark Jaw Rocket TAKE-OFF!! 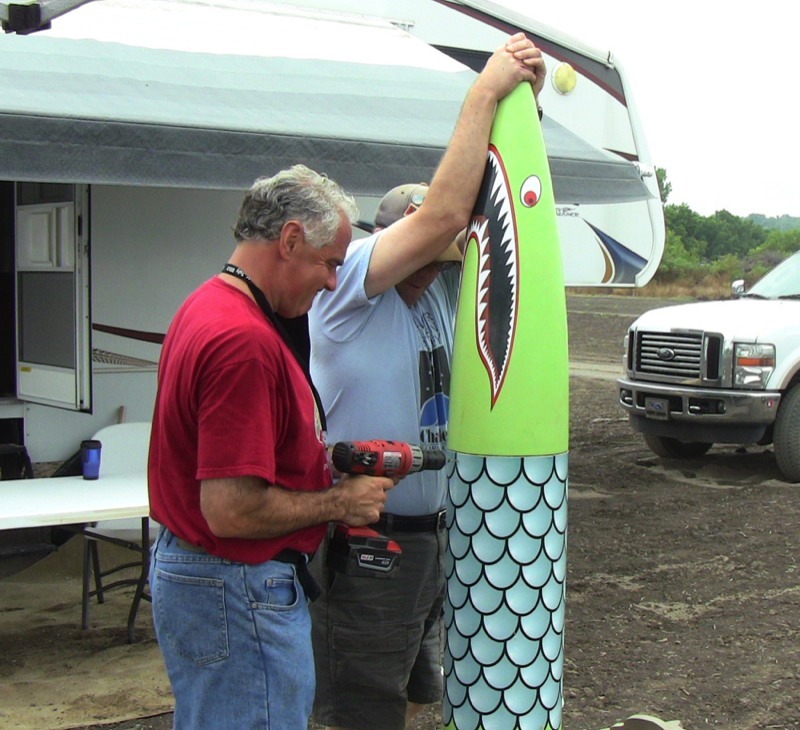 Here is the winning rocket at the "ODD ROCKET" Competition at Large Dangerous Rocket Ships Event 2012. Discoveries -Science Channel aired this event late October. 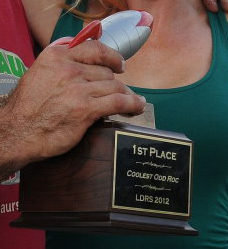 The Megalodon Shark Jaw Rocket got the highest score ever awarded (a total of 98 points) at a LDRS Odd Rocket Competition. 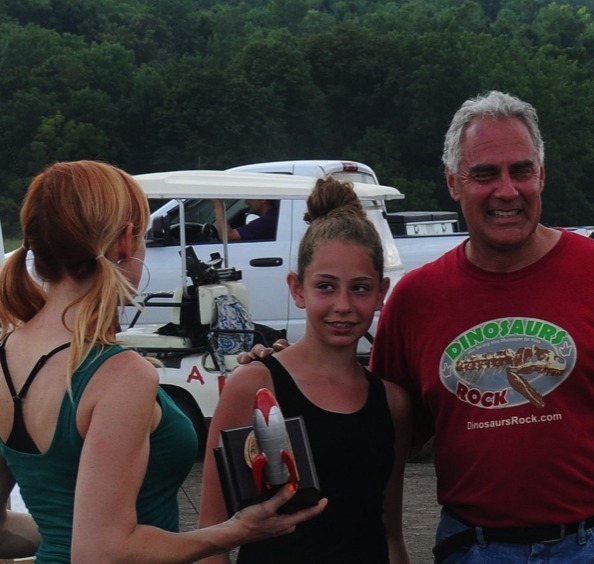 The "Judges" awarded 1st Place to the Megalodon Shark Jaw Rocket for original design, scientific value, along with a perfect flight with a safe landing. 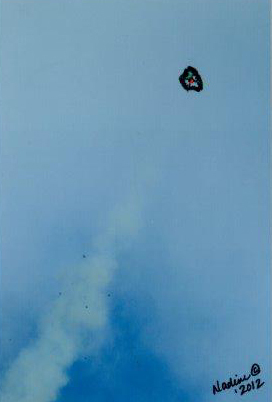 This was one of the only "Odd Rocket" at the competition that landed safely and could be flown again right away. 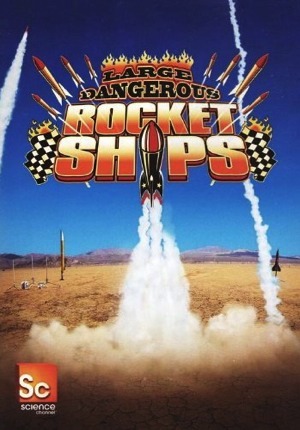 Go online to DISCOVERIES Science Channel - click on TV Shows - click on Large Dangerous Rocket Ships to see if and when they are airing this show again. I don't care how corny this sound but I could have never won this event if it wasn't for my team pictured above. Starting at the left is Dr. John Caramagna, John Huibregtse, Barbara Grocki (Caramagna), Aliza Brown, Neil Brown and Dan Michael. So here are some much deserved thank-you's. First - a huge thanks to my good friend and rocket mentor Dan Michael with whom I consulted with on each step of the building process and who advised me on building techniques, construction and rocket motor choice as well as taking his time to come to my home to help me build the braces to hold the jaw in place on the Meg Jaw Rocket. No question that Dan helped me win this competition with the highest score ever awarded (98 Points out of a possible 100!!) at a ODD ROCKET Competition at the Large Dangerous Rocket Ships event. To my daughter Aliza whom from the beginning kept telling me to go for it with "NO REGRETS". Aliza was very motivating all along and told me numerous times not to short change anything and to do everything possible to make sure I knew in my heart that I did the best I could. This advice was especially helpful at the field 1-hr before the launch when I had a "feeling" that something may not be 100% with the altimeter bay. 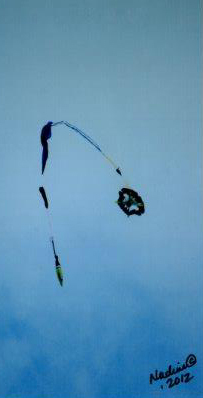 We actually had to open up the rocket, pull all the parachutes out, unhook the altimeter bay and I noticed that the battery was not 100% secure which could have led to a catistrophic failure of this rocket if the parachute didn't deploy. So - with the altimeter bay now 100% secure I felt completely confident that there was nothing else to do but wait and see what happens. No Regrets Aliza - I love you my little girl!! To my good friends John and Barbara Caramagna who helped tirelessly and stayed an extra day to help and support this effort and to make sure the Meg Jaw Rocket was placed on the tower correctly and helped with the recovery of all of our rockets. Great photos as well so thanks for all your help. 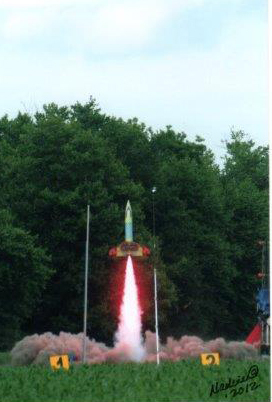 And finally to my good friend and Director of the Challenger Center in Suffern, NY where the Meg Jaw Rocket is now displayed, John Hubregtse (pronounced: hu-brex), helped all the way through with the initial test launch (see photo below), as well as with any and all details of the launch of this rocket. 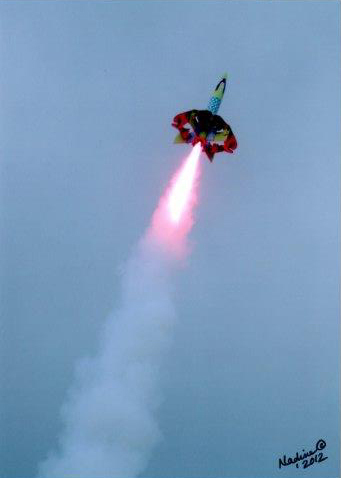 John Huibregtse and I are getting the test launch ready. 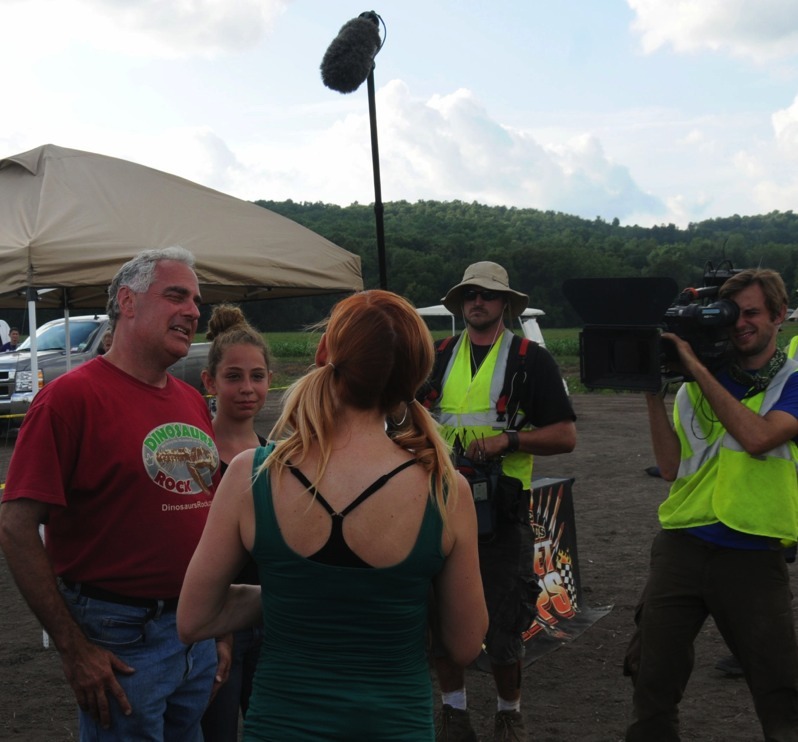 Shark Entertainment filmed the event for Discoveries Science Channel. 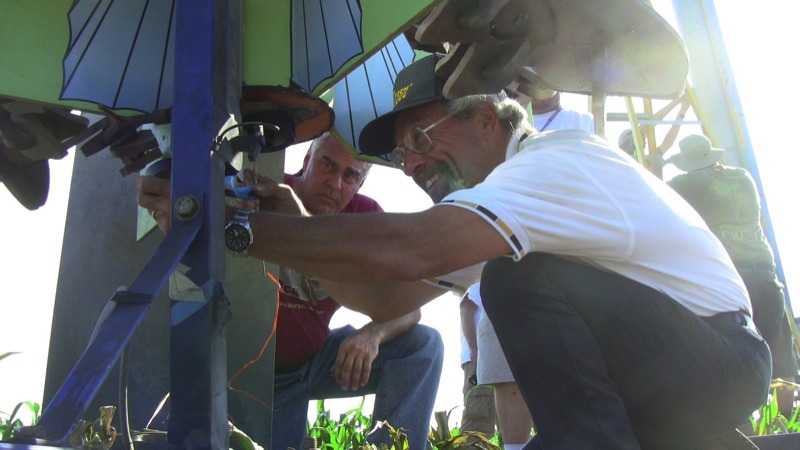 John and I putting the final screws into place to hold the nose cone in place during flight. The Meg Jaw Rocket place on the truck to be transported to the launch pad. 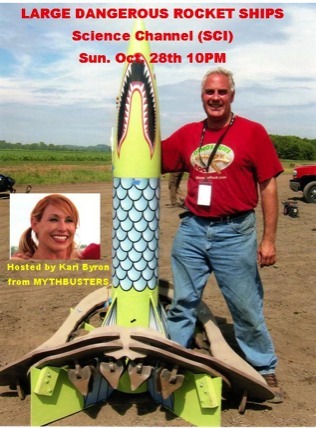 Speaking with Kari Byron about the specifics of the rocket for the show. More facts about the Megalodon Shark are being discussed with Kari. Here I am being asked about my chances of winning this competition. 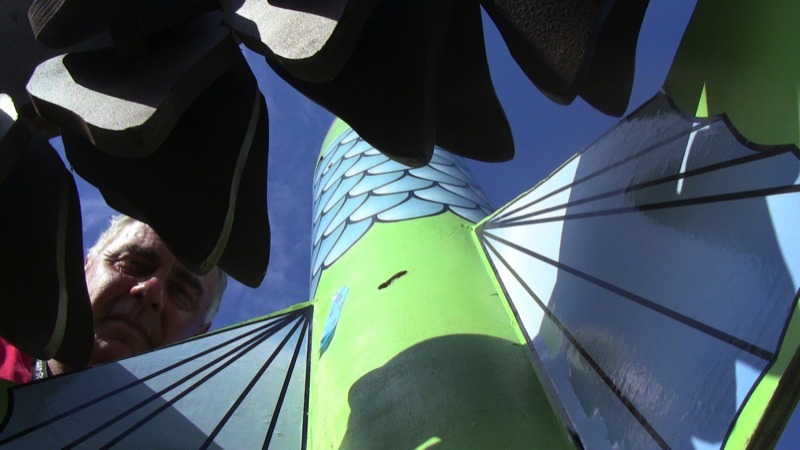 John Caramagna took this great shot of me wondering what the hell he was doing under the rocket. 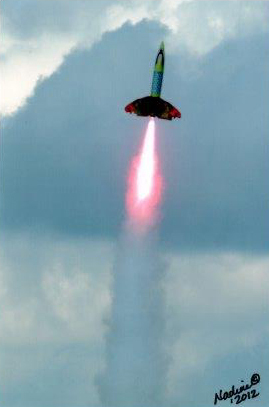 Dan Michael inserting the thermite ignitor into the huge N3300 Aerotech Redline Motor. Sitting Pretty on Display at LDRS. 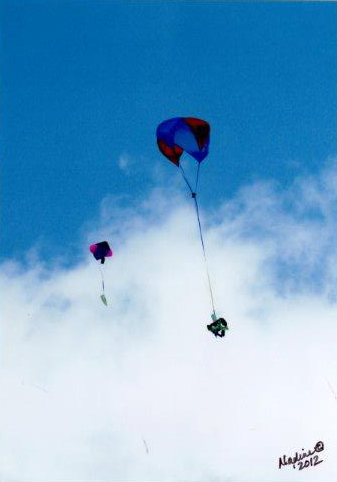 Pre-Launch Photo - Getting ready for the flight. 5 - 4 - 3 - 2 - 1 - LIFTOFF!! 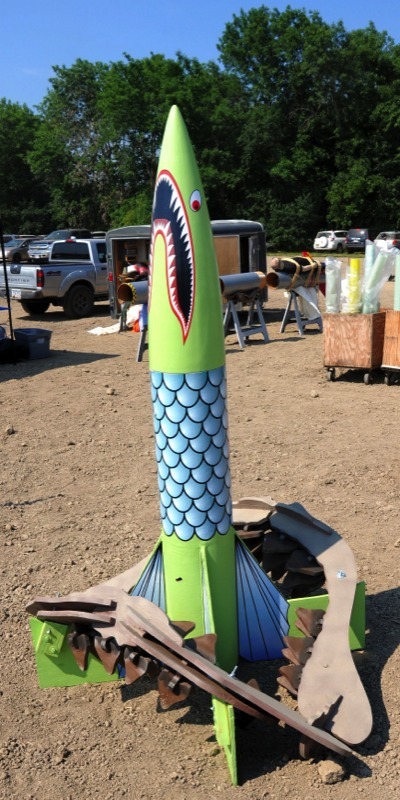 The rocket was over 7-ft tall. Look at the huge red flames. 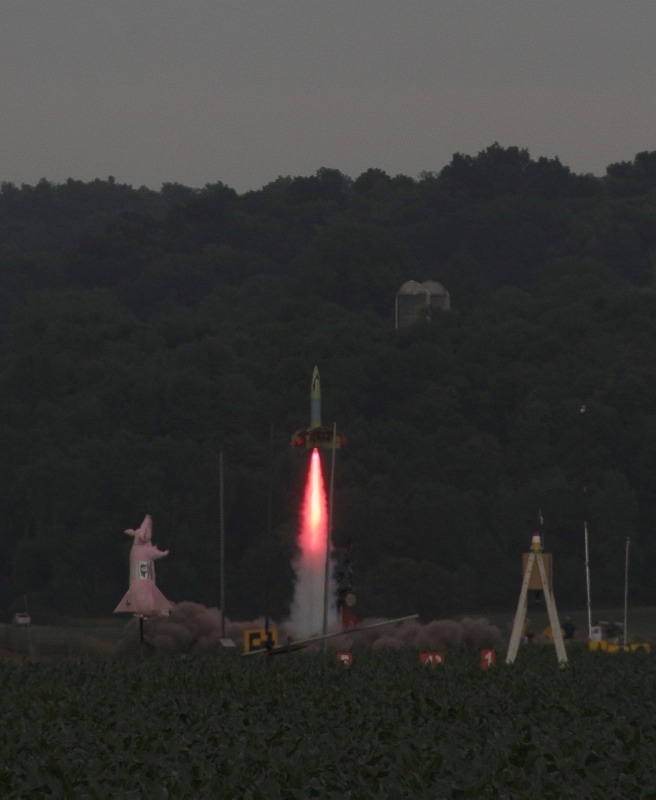 The Meg Jaw Rocket swung back and forth during the flight just as I had predicted to the judges. 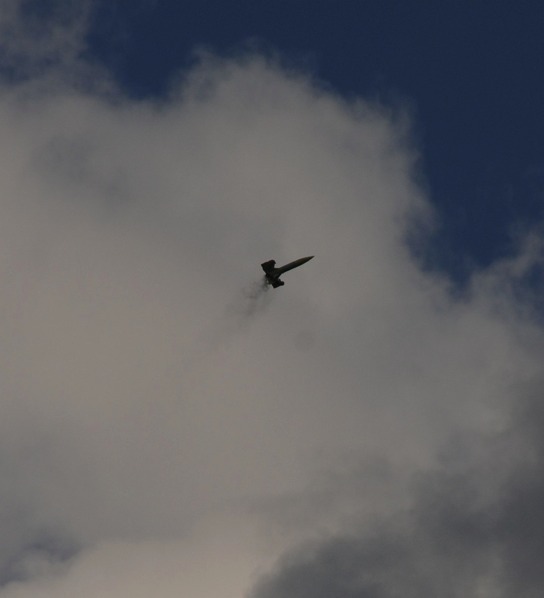 It flew within 1-ft of my predicted altitude - 1000-FT. It first went to the right now its turning to the left - thats from the air hitting the jaw. It viered back and forth 3 times and the 16-lb weighted nose cone kept straightening it out. The moment of truth - will the parachute deploy? Once I saw the nose cone blow off I knew we were home free. WaHoo! We Have An Event!!!! What a relief. A complete moment of joy when everything worked as planned. 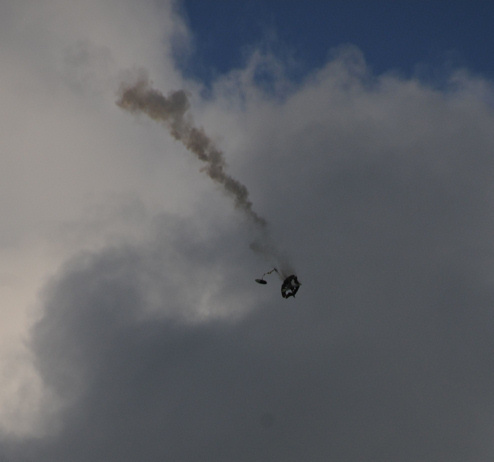 Successful deployment of a 24-ft RocketMan Parachute for the main airframe and jaws and a 8-ft RocketMan Parachute for the nosecone brought this rocket down safely. My daughter Aliza was there to celebrate with Dad. 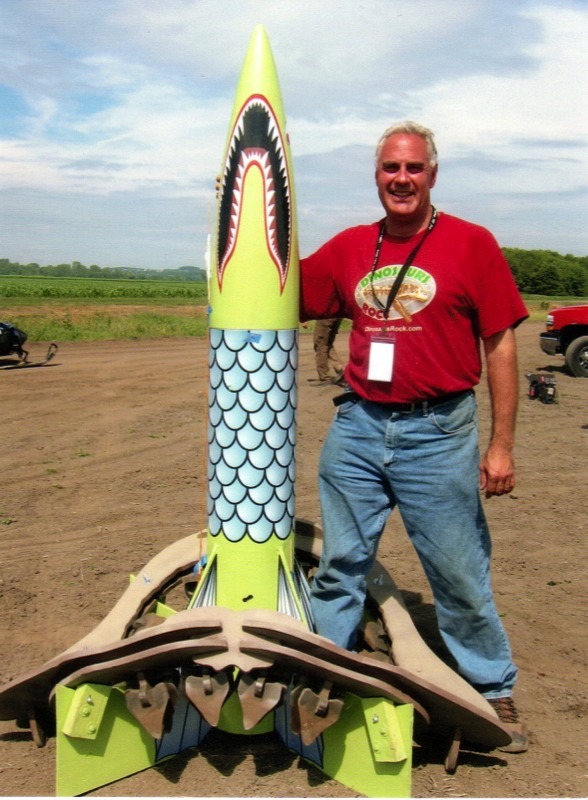 Both judges scored the design, engineering, flight and scientific significance of the rocket (by the way, that is what they said) a total of 49 points each out of 50 which gave me a 98 out of 100 which is the highest score ever awarded at a Odd Rocket Competition at LDRS. 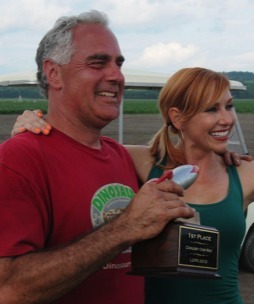 Here I am accepting the 1st Place Trophy for myself and my Team. 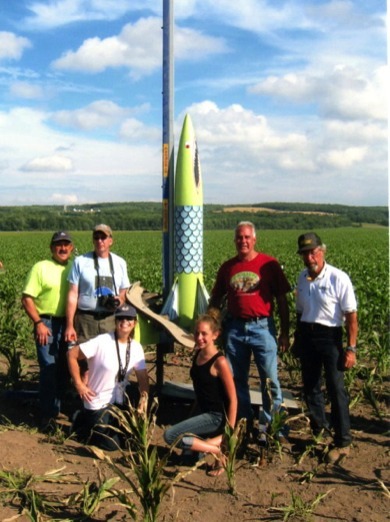 I will quote the judges as saying "this rocket had some thought behind it. 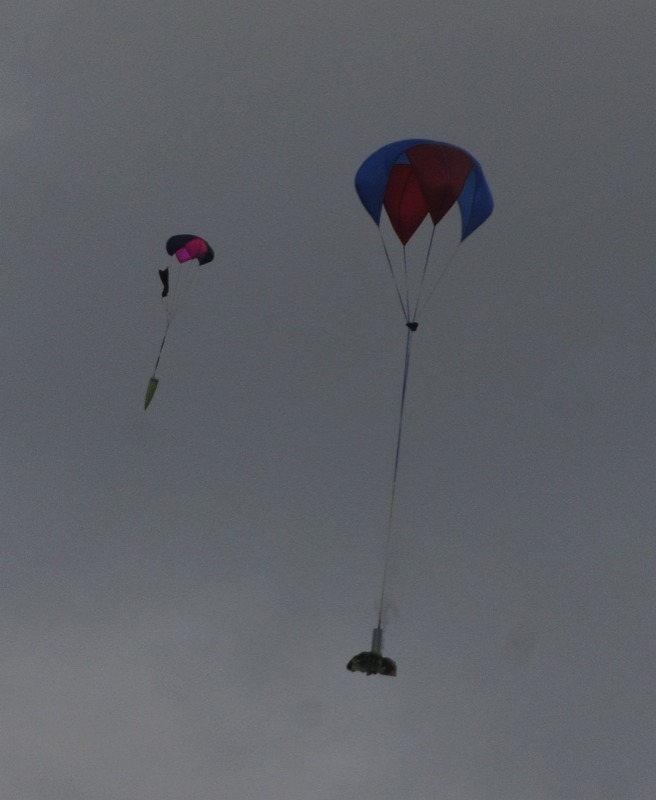 It wasn't something that one thought to just stick a motor in it to see if it would fly" - use this information as a clue to how you build your "Odd Rocket" at the next competition. 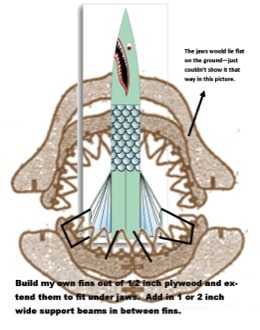 To view build movies of the Megalodon Shark Jaw Rocket and get other details that might help you win a "Odd rocket" competition click here. 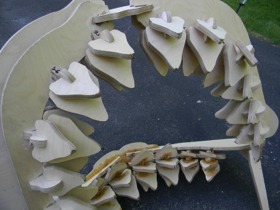 Click here to see how the Megalodon Shark Jaw Rocket Was Built.